A systematic overview of more than 100 studies comparing organic and conventional farming finds that the crop yields of organic agriculture are higher than previously thought. The study, conducted by researchers at the University of California, Berkeley, also found that certain practices could further shrink the productivity gap between organic crops and conventional farming. The study, to be published online Wednesday, Dec. 10, in the Proceedings of the Royal Society B, tackles the lingering perception that organic farming, while offering an environmentally sustainable alternative to chemically intensive agriculture, cannot produce enough food to satisfy the world's appetite. "In terms of comparing productivity among the two techniques, this paper sets the record straight on the comparison between organic and conventional agriculture," said the study's senior author, Claire Kremen, professor of environmental science, policy and management and co-director of the Berkeley Food Institute. "With global food needs predicted to greatly increase in the next 50 years, it's critical to look more closely at organic farming because, aside from the environmental impacts of industrial agriculture, the ability of synthetic fertilizers to increase crop yields has been declining." The researchers pointed out that the available studies comparing farming methods were often biased in favor of conventional agriculture, so this estimate of the yield gap is likely overestimated. They also found that taking into account methods that optimize the productivity of organic agriculture could minimize the yield gap. They specifically highlighted two agricultural practices - multi-cropping (growing several crops together on the same field) and crop rotation - that would substantially reduce the organic-to-conventional yield gap to 9 percent and 8 percent, respectively. 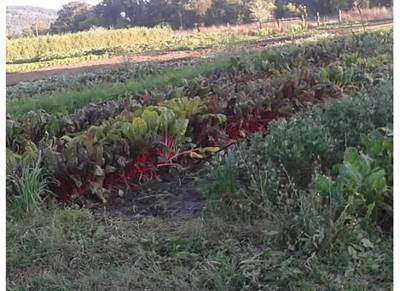 "Our study suggests that through appropriate investment in agroecological research to improve organic management and in breeding cultivars for organic farming systems, the yield gap could be reduced or even eliminated for some crops or regions," said the study's lead author, Lauren Ponisio, a graduate student in environmental science, policy and management. "This is especially true if we mimic nature by creating ecologically diverse farms that harness important ecological interactions like the nitrogen-fixing benefits of intercropping or cover-cropping with legumes." "It's important to remember that our current agricultural system produces far more food than is needed to provide for everyone on the planet," said Kremen. "Eradicating world hunger requires increasing the access to food, not simply the production. Also, increasing the proportion of agriculture that uses sustainable, organic methods of farming is not a choice, it's a necessity. We simply can't continue to produce food far into the future without taking care of our soils, water and biodiversity." At last, a definitive statement regarding organic agriculture's productivity. It should come as absolutely no surprise that it is on par with industrial ag. In the near future, we can expect to see organic outproduce industrial. 2. Organic agriculture produces crops with greater nutrient density than industrial. And yet the Organic market is growing by double-digits every year. Just make sure your not reading Monsanto's reports and you will know better. 10% reduction is huge, on a global scale. BUT yield is not the only issue, its also COST per acre, which is also much higher. Finally, these examples are for PRODUCE, already a high labor cost per item crop. We grow almost NO Organic versions of our big Ag crops. Indeed, last year we grew 240 MILLION acres of just Corn, Soy and Wheat. In comparison, we grew just 700,000 acres of these three crops organically. It would be a huge surprise, nay, an extraordinary calim, if "organic food" production is just 80 % of the standard practice. It has been known since the Rome meeting 1960, and really underscored by research in teh last decade, that its productivity is 50-60 % of standard. Of course they can have uncovered a statistical problem, as they claim. But I don't see the extraordinary evidence needed to say that it is better for nature - wasting less resources (whether land, energy or less pollution). The mere mention that 3 produce are not significantly different from standard is a warning sign, in data fishing you are bound to discover seeming data and they accept it without taking a deeper look. It will be interesting to look further on this, and why they claim a different result than all earlier research. - It is much more polluting than standard farming. - It is a serious health problem, since using manure as nutrient produce antibiotic resistance in bacteria (even manure from animals that has never seen antibiotics), same as our sewage plants do. It is a new, but important, discovery reported a few weeks back. Why would stopping "world hunger" be more important than population control? I get tired of social media assuming and regurgitating their euphemistic,PC version of popular social ethics. If the scientific community wants intellectual honesty,then stop white-washing subject matter and start approaching solutions by considering primary causes. The one primary cause of ALL human and environmental degradation is Overpopulation....period. The one primary cause of ALL human and environmental degradation is Overpopulation....period. please feel free to remove yourself from the equation. "The one primary cause of ALL human and environmental degradation is Overpopulation....period." There is nothing further from the truth. Earth could easily feed at least 50 billion people. The problem is not the number of people but the principles and organization of production, management and distribution.